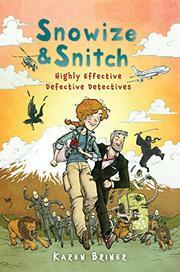 Hoping to find her lost guardian, Doctor Professor David Ezratty, 12-year-old Ever Indigo Nikita Stein teams up with a pair of detectives battling the forces of the evil ColdCorp Corporation. When Doc disappears, a crow from the future brings Ever a message: save the detectives. But who are they? Following a holographic message left in her guardian’s laboratory, Ever solves this first mystery by going through a formerly forbidden tunnel that takes her to the office of Harry Snowize, in denial about his imperfect memory, and Snitch, a giant African pouched rat that communicates in sign language. These are the defective detectives. This elaborately constructed and bizarrely detailed adventure is full of slightly off-kilter references and scene changes. From South Africa to Zimbabwe, Japan, and Spain, and back to Cape Town, the unlikely trio pursues the problem of disappearing scientific minds. Occasionally they’re joined by Doc’s perpetually angry robot refrigerator. Ever has a useful photographic memory, but she also has an attitude problem of her own. Struggling in school, the sarcastically nicknamed “Einstein” believes she’s “a magnet for bad luck.” Briner plays with quest-adventure tropes, but it’s the elaborate vocabulary and play with words that will appeal to her audience. Ending with a grand semantic twist, this convoluted caper even offers a satisfying solution to the mystery of Ever’s missing parents. Finished interior illustrations were not seen, but the cover depicts Ever and Snowize as white.